The brand new Contura 35L has just won the prestigeous Best in Show award at this year's Hearth & Home Show in Harrogate! 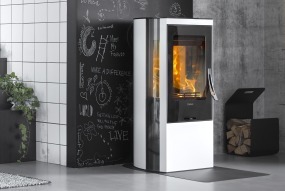 Contura 35 low is a stove with a lot of choices: you can choose between three different surrounds, each with its own specific, aesthetic qualities: glossy white steel, sober black steel or natural soapstone. All models have a glass top and side glass areas so more of the fire can be seen. We will soon have one of the amazing stoves on display in our Chobham shop - please pop in to have a look!